I noticed that there was no list for buses that ran in Nassau County, so I thought I'd make one. I'm working on additions such as the Blitz GM's from NYCTA, the RTS's from NYCTA/OA (thought I had a list, will look for that) and some Flx New looks loaned from NYCTA during the 90's. Any additions/corrections to these or from my previous post? Isn't Bee Line / Alert Coach #617 now part of the Museum Fleet of NYCYA and is at the East New York shops for restoration ?????? I thought they had one of them, but I couldn't remember the number. Its definitely 617....I don't know who has 614. Maybe a private collector ? The Motor Bus Society's Directory of Preserved Coaches shows no Bee Line 5106 in the registry but does show Bee Line's # 564 - a 4512 - as still in existence and owned by a fellow in Hyde Park, New York who I suspect is related to the Carter family because he owns other antique Bee liners. I know the MTA wanted to fix up #617, but that was before all the budget problems, I have no idea what happen to it. I read somewhere else that #611 was kept by someone in the colors of another company. Note; the 1952's were built for another company and rejected on the assembly line (see photo attached of # 262 thanks to nfnovelties of eBay). Further note that this group came without factory directional signals and that Hempstead's shops, using the best custom fixtures of the day, placed their own neatly above the headlamps. Anyone have any know the year of an old MSBA Fishbowl #9117 that has been broought to Mitchel Field to be Restored? This is a 1930 Model 511-2-H2 (known as the Metropolitan series) carrying fleet # 218B and purchased used from Nevin-Queens Bus Lines, Inc. of Jamaica, New York in 1942. Of note is the New York State required mechanical exhaust system on the roof and the letter 'B' following the fleet assignment. While a letter either preceding or following a fleet number on New York metro area buses of the thirties was not a requirement, several companies did so including but not limited to Green Bus Lines with a 'G', Avenue B and East Broadway with an 'A', North Shore Bus Company with an 'N' and Triboro Coach with a 'W' (what the W was for is unknown). 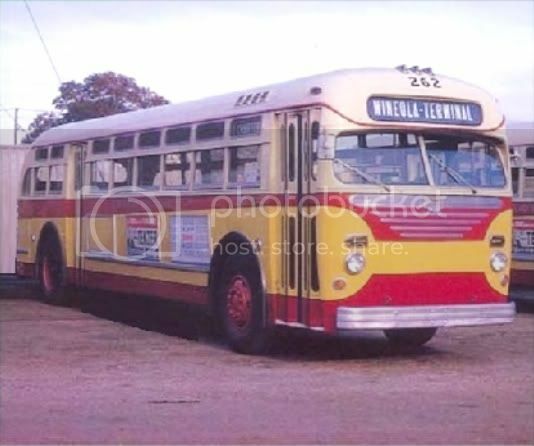 Photo is part of a two page ACF brochure courtesy of 4509bus and is up for bid on eBay as item # 370631055540.